That quote by Michelangelo has been a huge driving force for us here at rG. Our shop was founded on the ideal of demanding more from ourselves and being different than the other post-production shops in the advertising and creative industries. Our love and passion for creativity and design is what keeps us aiming higher. That is partially why OC Metro Magazine named rG a top place to work in Orange County in July 2009. Then in 2011, Dell, in partnership with Mastercard and Microsoft, launched their “America’s Favorite Small Business” contest. Admittedly we were somewhat ashamed our roots for some reason, but we saw this as a great opportunity to aim high and showcase just how far we had come in such a short period of time. As part of the initial entry process, rG, along with other small businesses from around the country, submitted a three minute video telling our small business story and how we use technology to be successful. Our story has been a history of “David versus Goliath” battles. rG competes against some of the Titans of the advertising and design industry and we saw this as just one more battle in our David story – and we were up for the challenge. So anxiously we waited to see if we would be one of the 10 finalists out of the hundreds of entries. But we didn’t just sit back chewing our fingernails. We knew the hard work and energy we put into our video entry, so we started planning. We pulled together every resource and called in every favor we had. Our team knew that if we were to make it into the top 10 and the voting stage of the contest, we would need all the help we could get. Part of building a company from a group of creative minds in a tiny garage into a true creative agency is the people on the fringe who help you grow along the way. Lucky for rG those folks included some of the best social media, branding, public relations and strategic minds in the business. And then the day came – rG had made it into the top 10 and our team kicked into action. Social media was a huge medium for us to get the word out. We just didn’t realize how far out it would get. 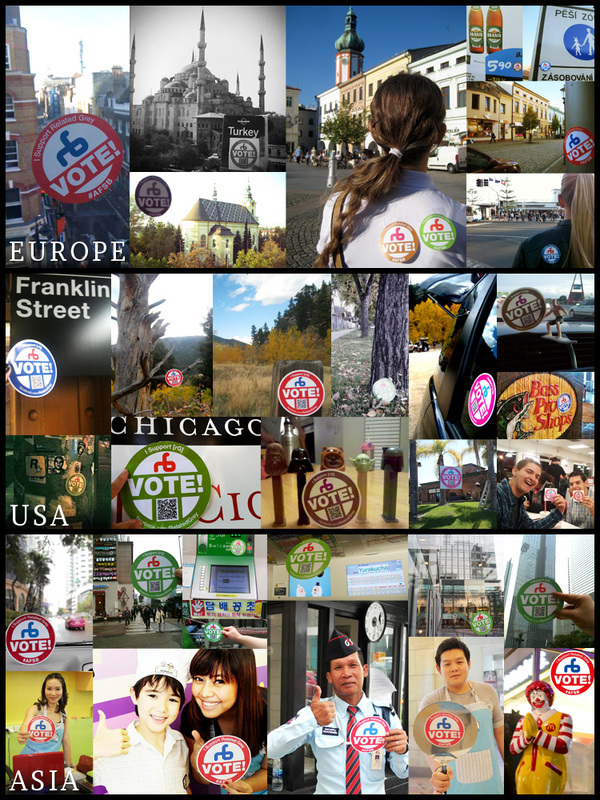 Before we knew it, we had friends across the globe, from Europe, Africa, Asia and Australia, pushing our brand and encouraging their friends and family to vote for rG. It helped us learn one thing quickly; even small businesses here in the U.S. can have an impact across the globe. What really shocked us though was how much support we got via social media from others in O.C. and even Los Angeles – from the likes of the OC Fair, Los Angeles news anchors and countless others who had never heard of rG and our story before now. A big part of our success using social media as an outreach tool had a lot to do with branding. That's where our friends at Gamut Media came in to help us out. This is where the “Vote for rG” was born, and thanks to their support, we were cranking out stickers that were appearing around the world. Our PR team was feverishly at work as well. For us this wasn’t just about encouraging people to vote for rG, but a chance to introduce our team, our vision, our passions and our creativity to a wide audience, which without this contest might not have been possible. From mentions in OC Metro to The Orange County Register, the coverage we received from our local media was awesome! In the end though, rG didn’t win Dell’s contest. The exposure we gained through the contest, combined with the media exposure, was more than enough. Our story isn’t over, not by a longshot. We still have higher to aim. We would have never imagined, four years ago when we were working out of a garage, that we would have come this far this quickly. And we owe it all to our team. Just goes to show that a whole is only as good as the sum of its parts.